Environmental Management System (EMS) is a set of processes and practices which enables an organization to manage the impacts of its organizational activities on the environment and also to increase its operating efficiency. It is a framework which helps the organization to achieve its environmental goals through consistent control of its operations. The framework includes organization’s environmental programs in a comprehensive, systematic, planned and documented manner and includes the organizational structure, planning and resources for developing, implementing and maintaining organizational policy for the protection of the environment. It provides a structured approach to planning and implementation of the environment protection measures. However the EMS itself does not dictate a level of environmental performance that must be achieved since EMS of every organization is tailored to meet the business and goals of the organization. The organization commits initially to an environmental policy. It includes review of the present status and future environmental goals of the organization. Analysis of the environmental impacts and the legal requirements. Keeping environmental policy as the basis, the organization sets the environmental objectives and targets for reducing environmental impacts and for complying with the legal requirements. Establishment of plans for improving the environment performance and also for meeting the objectives and targets of the organization. Monitoring, measuring and evaluating the progress for achievement of the objectives. To ensure environmental awareness and competence of the employees of the organization. To take corrective actions if the objectives and targets are not being met. To have regular review of the progress of the EMS and to make improvements on continuous basis. In September 1996, the International Organization for Standardization published the environmental management system standard ISO 14001. This is an international standard describing specific requirements for an EMS. ISO 14001 is a specification standard to which an organization may receive certification or registration. ISO 14001 is considered the foundation document of the entire series of ISO 14000 standards. This standard has been updated in the year 2004. The standard is the most popular framework for an EMS and is the official international standard for an EMS. ISO 14000 refers to a family of standards and guidance documents to help organizations to address the environmental issues. It helps the organizations (i) to minimize the negative effect of their operations on the environment, (ii) to comply with applicable laws, regulations, and other environmentally oriented requirements, and (iii) to make continual improvements in these aspects. The standards in this family are for environmental management systems, environmental and EMS auditing, environmental labeling, performance evaluation, life-cycle assessment and product standards. The ISO 14000 standards reflect different aspects of environmental management. The following list outlines the broad coverage of these standards. Other ISO standards includes ISO 14030 – Post production environmental assessment, ISO 14031 – Environmental performance evaluation—Guidelines, ISO 14050 – terms and definitions, ISO 14062 – Making improvements to environmental impact goals, ISO 14063 – Environmental communication—Guidelines and examples, ISO 14064 – Measuring, quantifying, and reducing green house gas emissions and ISO 19011 which specifies one audit protocol for both 14000 and 9000 series standards together. ISO 14001 sets out the criteria for an environmental management system. It does not state requirements for environmental performance, but maps out a framework that an organization can follow to set up an effective environmental management system. It can be used by any organization that wants to improve resource efficiency, reduce waste and drive down costs. Using ISO 14001 can provide assurance to the organization’s management and employees as well as external stakeholders that environmental impact is being measured and is being improved. ISO 14001 can also be integrated with other management functions and assists companies in meeting their environmental and economic goals. An environmental policy supported by senior management. The policy is the organization’s commitment to the environment. The policy is also used as a framework for planning and action. The identification of environmental aspects and impacts and the determination of significant environmental impacts which the organization’s activities, services and products may cause. Identification of legal and other requirements and ensuring access to relevant laws and regulations to which the organization adheres. Establishment of environmental goals for the organization and the development of objectives and targets in line with the policy, environmental impacts and the views of the stakeholders. The environmental management programs are made for achievement of objectives and targets. These programs are action plans to achieve the objectives and targets. Establishment of defined roles, responsibilities and authorities for environmental management and provision of appropriate resources. A communication process of the environmental management system is established for internal as well as external communications on environmental management issues. The external communication is to all stakeholders and interested parties. The development of environmental management system documentation as required by the standard for the maintenance of information on EMS and related matters. The development of document control procedures for ensuring effective management of procedures and other system documents. The development of operational control procedures for identifying, planning and managing the activities in line with the organization’s policy, objectives and targets. The development of emergency preparedness and response procedures for identified potential emergencies. The development of procedures for monitoring and measuring of operations that can have significant impact on the environment. These procedures are to monitor key activities and track performance. An evaluation of compliance procedure for conducting periodic assessments of compliance with the legal requirements. Procedures developed for the management of non conformance, corrective and preventative actions. These procedures are made for identifying problems and preventing their recurrence. 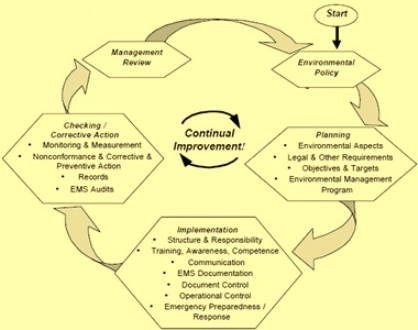 The development of a procedure for maintenance and management of records of EMS performance. A program for completing internal audits and corrective action. The audit of EMS is carried out periodically to verify that the EMS is operating as intended. The development of procedures for management review by senior management in order to ensure continual improvement. There are many benefits which an organization can get by implementing the EMS. These benefits are enumerated below. The organization improves its environmental performance which is reflected by reduced emissions and better utilization of natural resources. An organization identifies environmental risks and manages these risks accordingly by developing an environmental management system. Organization promotes a positive environmental image with customers and thus increases demand for products and services. The operating costs are lowered through reduced resource consumption and waste production. The organization achieves environmental commitments and environmental policy requirements. The environmental legal requirements of the organization are met. There is increased employee awareness and pride. The organization commits and meets its social responsibilities. There is an increased knowledge and control of environmental health and safety issues by everyone in the organization. Organization is easily recognized in the market and amongst stake holders for its environmental management efforts for implementation of ISO 14001 environmental management system since this system is the most recognized system.